15. 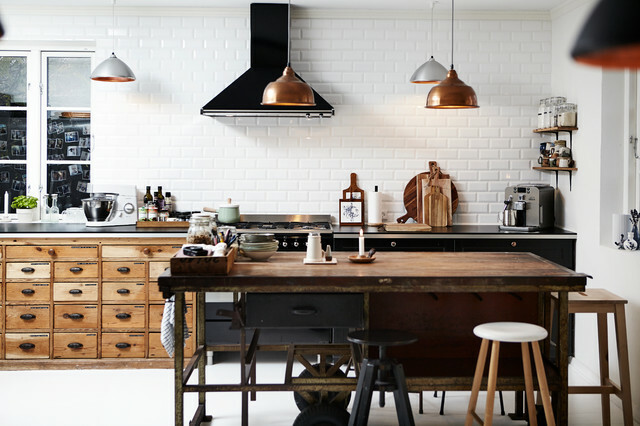 Location: Blegind, DenmarkFeatures: A rustic chest of drawers and dining table and a medley of vintage-inspired pendants are the stars of the show in this otherwise fairly minimalist kitchen. I like a lot here -- the wooden lowers on the right, The contrasting dark lowers. All the light fixtures. Even the two different toned stools! Maybe if we got a black hood vent we wouldn't need the hood cover -- I like the way it looks.